Before we begin, a quick disclaimer -- this is NOT going to be about Anthony Davis. In fact, I'm only mentioning him to say I'm not going to talk about him. If you require additional content about the ongoing, totally-not-collusion-between-LeBron-AD-and-their-mutual-agent trade saga, just find the nearest expired feline, spin it around your head like a helicopter, and you should be good to go. No, today is not about the biggest fish in the sea. With Thursday's trade deadline rapidly approaching, it's time to take a look at which teams may be willing to make key pieces available, who those pieces are, and what sort of interest they might draw around the league. With so many teams still in contention, this year's deadline has a chance to be a true seller's market. Here are the top players teams in the hunt could be looking to pry away, non-Brow division. 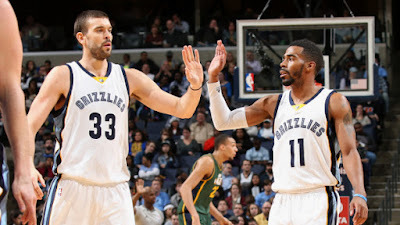 Marc Gasol and Mike Conley, Memphis Grizzlies: Grit 'n' Grind has been dying a slow death for years now, but with the Grizz fading (to put it generously) over the last month-plus -- Memphis is 3-17 since December 29th, to be exact -- we've now reached the point of reading the era its last rites. The front office has made it clear franchise tent-poles Gasol and Conley are both very much available, though the markets could be quite different for the two stars. Gasol has a player option in his contract for $25.6 million next season, which he will almost certainly decline to seek one last long-term deal. This makes him little more than a rental, unless some team is interested in committing multiple years and assets to a 34-year-old seven-footer whose performance has declined drastically of late after a hot start to the year. The market for centers, even ones who offer a theoretical level of floor spacing AND rim protection, is likely to be tepid -- this is going to become a theme, so prepare yourselves -- meaning there's a good chance on Thursday afternoon we'll be scratching our heads, saying "Wait...they got Gasol for WHAT?" It's hard to find many teams for whom Gasol would represent an upgrade and would simultaneously be willing to shell out any real assets in search of a playoff push. Boston could make a little sense, if they thought a Gasol-Horford pairing was tenable. Charlotte is another option, though if I were MJ (to be extremely clear, I am not), I'd be reticent to start throwing around picks just to get up to the sixth seed and get wrecked in the first round by Philly or Boston, given how uncertain their future is regarding soon-to-be free agent Kemba Walker. None of the teams in the mix out West make a ton of sense, with the exception of perhaps the Clippers, who we'll get to shortly. Memphis knows they are going to lose him for nothing at the end of the year, in which case they would at least free up cap space, so they may be hesitant to take on long-term money in any exchange, unless it comes with significant draft pick sweeteners attached. It's tough to construct a deal which is good for everyone involved, but if a contending team has a low first round pick they are willing to part with and the right combination of contracts, I suspect Big Spain could be pried away at a shockingly low cost. On the other side of the coin, Mike Conley could draw significant interest from a few teams, which would have seemed impossible two years ago when he signed what was, at the time, the largest contract in NBA history. While the deal is never going to look like a bargain, with Conley returning largely to health this season and the expectation the salary cap will continue to rise over the next few years, suddenly he looks a lot more enticing to teams in need of a final piece to their puzzle, even with another $67 million on the books beyond this season. Indiana would have made a lot of sense (Conley is from Indiana originally, and I'm always a fan of the "hometown guy" narrative) until Victor Oladipo's knee exploded, making it much more likely the Pacers will go full Champ Kind and sit the next few plays out. The scuttlebutt suggests the other likely destination is Utah, who have engaged with Memphis in talks surrounding "Ravishing" Ricky Rubio, whose contract is expiring, and Derrick Favors, whose $16.9 million salary for next season is unguaranteed and continues to be a poor fit next to reigning DPOY Rudy Gobert. Conley would certainly make Utah's offense more dynamic -- even amid questions of backcourt fit with the once-again-scorching Donovan Mitchell -- while also forcing coach Quin Snyder to abandon the Gobert-Favors pairing, which could provide unintended benefits as well. I can envision a world where San Antonio makes a play for Conley, but Pop seems pretty happy with his current point guard situation going forward, so the Spurs are unlikely to overpay on the off chance a bidding war breaks out. Dewayne Dedmon and Kent Bazemore, Atlanta Hawks: The Hawks have looked shockingly competent in the second trimester of the season (12-12 since December 18th) with the emergence of John Collins as a nightly 20-and-10 threat, Kevin "Red Velvet" Huerter earning "young Klay Thompson" comps, and Trae Young, for all the criticism he's endured, showing legitimate flashes. That being said, competence was not the plan this year, so the front office will likely be looking to shed veteran contributors for future assets, and the two obvious guys other teams might have interest in are Dedmon and Bazemore. Dedmon is probably the bigger prize, having added the three-ball to his arsenal (37.4% from deep this year on 3.2 attempts per game) and sporting a contract which is both affordable ($7.2 million) and expiring. Teams in need of frontline depth but without the assets or intestinal fortitude to make a big splash could come calling, but with this being a clear rental situation, the return is unlikely to end up as more than a couple second rounders, at best. Bazemore is a useful, athletic wing, but he comes with the downside of a $19.3 million player option on his contract next season, and I've never been more of sure of anything than I am that Bazemore will pick up said option. The 4-year/$70 million deal was rotten before the ink on it was even dry -- thanks again, summer of 2016! -- and nothing has changed. A team like Sacramento, who has the only meaningful cap space remaining in the league and could use a guy who can guard big wings, might dip their toes in the water on Bazemore, but I suspect Atlanta is probably stuck with him for the time being. Jrue Holiday, E'Twaun Moore, Nikola Mirotic, and Julius Randle, New Orleans Pelicans: The Pels are 3-9 in their last twelve games amid a rash of injuries (including the last eight without He Who Shall Not Be Named) and have fallen to 13th in the West at 23-31. Whether HWSNBN gets traded before Thursday, shut down, or returns to play in a lame duck capacity, it appears unlikely things will get better for New Orleans anytime soon, leading to rampant speculation they may just try to clean house before the deadline and jump start the rebuild which is inevitably forthcoming. Randle and Mirotic are both excellent PFs on ostensibly expiring contracts -- Randle has a player option for next season he is likely to decline based on how well he's played this year -- and Moore is a proficient 3-and-D wing on an affordable deal through next season. Any opportunistic GM worth his salt should absolutely be sniffing around these guys. Mirotic would be a snug fit in places like Philly, Portland, or Utah. While Randle doesn't bring the same floor spacing ability -- making his integration into existing lineups a bit less seamless -- his athleticism, playmaking, and interior scoring ability could draw interest from smaller market teams looking to use the trade market as de facto free agency. Moore is exactly the type of role player who should be getting 15-20 minutes a game for a contending team. He is overextended in his current role as a big minutes starter often forced to play out of position and guard bigger wings, but he would have real value in a better ecosystem and could be had on the cheap. It will be fascinating to see whether or not GM Dell Demps makes Holiday available, either prior to the deadline or over the summer. Jrue is 28, playing some of the best ball of his career (21.0/ 5.1/ 8.0 averages per game), and remains a tenacious, active defender despite how precipitously the team's overall defensive performance has fallen off (24th in Defensive Rating after climbing up to 14th last season). He has expressed dismay with the Davis situation, and is still owed a truckload of money (approximately $79 million over the next three seasons, though the '21-'22 season is a player option, albeit one most point guards on the wrong side of 30 would happily pick up). He can play on- or off-ball and defend multiple positions, making him a fit in virtually any lineup. However, much like Conley, we know definitively he can't be the second-best player on a team with championship aspirations, which makes his contractual situation problematic even amid a rising cap. A guy in his 10th season is clearly not going to align with New Orleans' timetable for contention going forward -- if there is such a thing, and on the assumption pro basketball in New Orleans even has a post-Brow future -- but would the return for a player with his contract and robust injury history justify tearing the building down to its foundation? The same teams eyeing Conley might look at Holiday as well, potentially further eroding the Pelicans' leverage in any negotiations. Suffice it to say, things are bleak right now in New Orleans, and we probably aren't close to the bottom yet. Nikola Vucevic, Terrence Ross, and Aaron Gordon, Orlando Magic: Sensing a trend yet? Another team sinking in the standings (10-19 after a 12-12 start which was clearly fool's gold) with the "opportunity" to jettison veteran contributors and finally position themselves for a proper youth movement. Look, I love Vooch. He has been lights-out on offense, and is a deserving first-time All-Star. With that said, his contract is going to expire, and Orlando is going to be left with nothing in return for him, unless they think their cap space is really worth something at this juncture, which I would argue it is not. Vucevic has made himself into a perimeter threat (37.8% from deep on a non-fluky number of attempts), and he rates out defensively much better than his reputation would suggest. As with Gasol and Dedmon, the lack of true demand for centers -- even ones as undeniably skilled as Vooch -- among contending teams may depress the return, but I find it hard to believe it would be worse than doing nothing. Boston, the Lakers (if that other thing falls through, as it is increasingly appearing it might), Milwaukee, Charlotte, Brooklyn (potentially about to get Caris LeVert back to augment the stellar run they've been on), Miami, or even (ugh) the Wizards could all be possible destinations for Vooch where his talents would be put to better use. Ross is in a similar situation to Moore: a capable role player on the wing who is stretched a bit too far on a bad team but would be a useful contributor for a contender. He's having his best season as a pro, and probably wouldn't cost much to acquire based on his expiring contract. A number of teams who could use spacing and depth (Philly, I'm looking in your direction) should be lighting up GM Jeff Weltman's phone. Ross isn't going to move the needle that much for anyone on his own, but when the playoffs roll around, having another capable athlete who can knock down shots in a limited role can't hurt. Aaron Gordon is a trickier case. Although still only 23 years old, his game has noticeably plateaued over the last three seasons at a point where his physical profile and pedigree dictate he should be ascending to stardom. Some of that can be chalked up to playing out of position (for Christ's sake, he's a power forward), injuries, and being employed by an organization which never seems to have any sort of coherent plan, but at some point we need to see something to suggest there is a star-caliber player waiting to emerge. On top of the relative lack of production, the extension he signed with Orlando includes an unusual descending salary structure over the course of the deal, from $21.6 million this season all the way down to $16.4 million in '21-'22, leading to speculation the deal was signed with the specific intent of using him as a trade chip. The rub, as it pertains to this particular trade deadline, is the structure of the deal potentially makes Gordon a MORE valuable trade chip the longer they wait to deal him. He almost certainly needs a change of scenery (and role) to reach his ceiling, but with a salary which only becomes more palatable over time for a player approaching his theoretical peak, Gordon's value paradoxically increases (especially relative to a rising salary cap) as the deal gets closer to its expiration. The situation raises so many questions. Did Gordon want out of Orlando and agree to the contract specifically thinking it would facilitate a trade? If it works, does this portend another new avenue of player control over their professional destinies? Or did the Magic snooker him into it, thinking along the lines I laid out above? It's hard to imagine the Orlando Magic, who have been a complete and utter farce of an organization for most of the decade, are somehow now playing 3-D chess in contract negotiations, but the NBA is a weird league. In any case, if I were a rival GM, he is a player I would be actively pursuing. Again, Philly comes to mind as an intriguing destination, along with Utah, Indiana, and Portland. 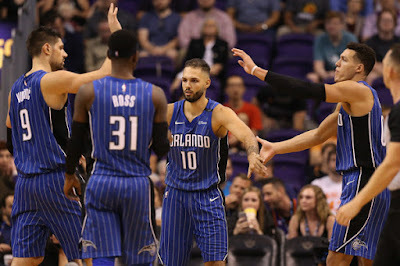 While Orlando's front office should hit the eject button on Vucevic and Ross simply as an act of self-preservation (and because it's the sensible thing to do), what they eventually do with Gordon will act as a signpost for where the organization goes from here. It's highly unlikely Gordon ever reaches his potential alongside young big men Mo Bamba and Jonathan Isaac; at what point does the team begin to harm both Gordon's career prospects and their own ability to extract the maximum return for him by actively keeping him from reaching it? Do we really believe their decision-makers are competent enough to thread that needle? The Clips are perhaps our most interesting deadline team because one could make a compelling argument for them as either a buyer or a seller. They are currently 8th in the West, and only a game back of Utah for 7th, so it's easy to say they should keep pushing for a somewhat unexpected playoff berth. At the same time, upstart Sacramento and the Lakers -- who obviously have a wide range of potential outcomes going forward, but at least should have a functional LeBron for the remainder of the season, "load management" be damned -- are nipping at their heels. And while they'll never admit it, the Clippers have a nefarious incentive to miss the playoffs. LA owes its first round pick this year to the Celtics (courtesy of the one and only Jeff Green, ladies and gentlemen! ), but it is lottery protected for this year and next. 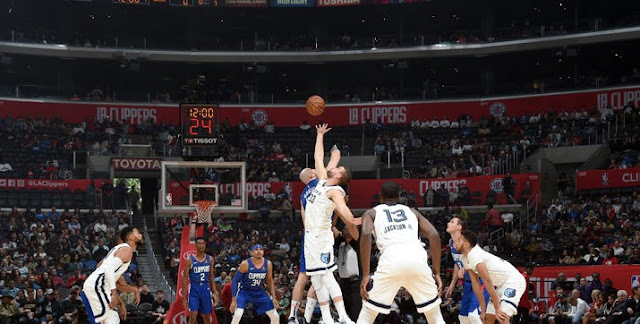 So in practice, holding on to the 8th (or even 7th seed) this season garners billionaire owner Steve Ballmer a few million bucks in gate revenues for a couple playoff games as the team gets dumped on by either Golden State or Denver, while costing them something like the 13th or 14th pick in the 2019 draft, a spot not far from where they snagged future star Shai Gilgeous-Alexander last year. Should they choose to operate with an eye towards the future -- for the record, I'm not saying it's right, just that it's perfectly rational -- then they could make some real needle-moving players available at the deadline, namely Harris and Williams. Tobias Harris has played phenomenally well all year, to the point many considered him a snub from the All-Star team. [Based on how stacked the West is, I probably wouldn't go that far, but it's not a crazy position. Rudy Gobert was certainly more deserving and also didn't get selected.] His contract is expiring, and there are a number of teams who could use a strong, athletic combo forward who can do just about everything on the court. On a personal level, I don't wish another trade on Harris; all he's done his whole career is continue to get better every single year and be "rewarded" for it with another trade to a new city. He is the perpetual backup plan for NBA franchises, which isn't a fate his game deserves. But he's only 26 years old, if you can believe that, so there is still time for him to find the right home. Maybe it happens on Thursday. Another frequent trade piece, Sweet Lou Williams, could also be available, as is tradition. Williams' contract is exceptionally team-friendly, and he remains an outstanding bench player, even in his 14th pro season. Finding a trade partner may prove difficult, since any team which could realistically consider Lou-Will to be the missing piece probably would not be able to offer a pick LA would find desirable enough to part with Williams' combination of production and value. His contract will still be outstanding next year (and if we're being honest, even the year after, when it becomes unguaranteed), so there's no hurry if the Clips can't find a deal that blows up their skirt. On balance, I would expect Williams to stay put for the time being, but if there's one thing the NBA trade deadline has taught us over the years, it's to expect the unexpected. Get your popcorn ready.